These Small-batch Sugar Cookies are perfect sugar cookies. Buttery, with slightly crisp edges and chewy centers, they’re fast and easy to make, require no chilling time, and can be made in just one bowl. 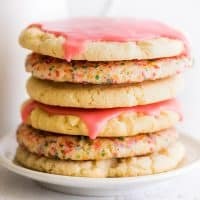 Plus tips and tricks for making *your* perfect sugar cookie. Preheat your oven to 350°F and a line baking sheet with parchment paper or silicone baking mat. In a medium bowl, cream together butter and sugar until light and fluffy. Add egg yolk and vanilla (or almond extract) and beat until well-combined. Add flour, baking soda, and salt, and mix until there is no dry flour left at the bottom of the bowl and the dough begins to clump. Divide dough into six parts and roll into balls. If rolling in sprinkles or sugar, do so now. Place dough on the prepared cookie sheet, well-spaced, and use the palm of your hand to press cookies out to 1/2-inch thick (no thinner). Bake for 9 to 12 minutes, until you see just a hint of golden color around the bottom edges of the cookies. Cool completely on the cookie sheet. Once cookies are cooled, in a medium bowl, combine powdered sugar, milk, and vanilla. Stir until well-combined. Add corn syrup and stir until smooth. Add about 2 to 4 drops of food coloring if desired and stir until uniform in color. Add more milk if necessary to get a drizzling consistency. Spoon over cookies and allow 10 to 15 minutes for the glaze to set. Enjoy! *To make glaze without corn syrup, simply omit the syrup and add milk by the 1/4 teaspoon until glaze reaches a thick drizzling consistency. Be careful not to add too much or the glaze might not set. Approximate nutritional information is for plain sugar cookies.